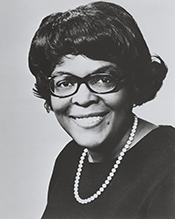 COLLINS, Cardiss, (wife of United States Representative George Washington Collins), a Representative from Illinois; born Cardiss Hortense Robertson in St. Louis, Mo., September 24, 1931; graduated from Detroit High School of Commerce, Detroit, Mich.; attended Northwestern University; secretary, accountant, and auditor for Illinois department of revenue; committeewoman of Chicagos twenty-fourth ward; elected as a Democrat to the Ninety-third Congress, by special election to fill the vacancy caused by the death of her husband, United States Representative George W. Collins, and reelected to the eleven succeeding Congresses (June 5, 1973-January 3, 1997); was not a candidate for reelection to the One Hundred Fifth Congress in 1996; died on February 3, 2013, in Alexandria, Va.
Cardiss Collins in Black Americans in Congress, 1870-2007. Prepared under the direction of the Committee on House Administration by the Office of History & Preservation, U. S. House of Representatives. Washington: Government Printing Office, 2008.